Thank you for visiting my blog; I hope you find something inspirational on these pages, as I have been inspired by others. I have enjoyed browsing through other people’s blogs over the last few months, finding so many knitting and crochet patterns, and tutorials, and quite simply feeling totally inspired by the generosity of the multitude of interesting and talented folks out there who are so willing to share their knowledge. I very much wanted to join in with this creative and limitless venture and hopefully, in time, I will contribute something that others may find useful and inspiring. Please ‘like’ the posts you find most interesting to help guide me with future content and feel free to comment and let me know what you are doing, I would love to hear from you. Thanks again for visiting and I hope you enjoy surfing this blog! You are so sweet. That’s a lovely offer. We won’t say no to one of your adorable additions but please don’t feel obligated! For the vines, we actually carry finished felt projects from DZI which are hand made and fairly traded from Nepal. We have a few felted leaf vines that we are hoping will work out well for this. We are a small yarn store in Avon CT and are thinking about doing some yarn bombing of our own just to decorate around the shop. We LOVE your pieces and especially fell in love with your lighthouse. Do you ever offer tutorials on how to recreate pieces like that? We have two tall pots outside of our door that we would like to create seasonal yarn bombed pieces with some height and the lighthouse would be perfect for summer as we are in New England USA. Thank you so much for your kind words. I can certainly recommend yarn bombing as it’s so much fun to do, there are no limits so you just let your imagination run wild! The lighthouse was created my my lovely friend Bernie who crochets free hand so sadly there is not pattern. I can tell you that it is created using upturned plantpots decreasing in size. In the top to make the light is a solar powered garden light. I really hope this helps and that you have lots of fun decorating your shop. Please, please share some pics and if there is anything I can do please don’t hesitate to get in touch. Thanks so much for getting back to us. We’ve decided to start with a fall theme and are planning to purchase a trellis and decorate it with knit pumpkins, vines, gourds, and indian corn. When it’s done, I’ll definitely send a picture. Hopefully the lighthouse will be something we can do for next summer. Thanks so much for sending those details!! 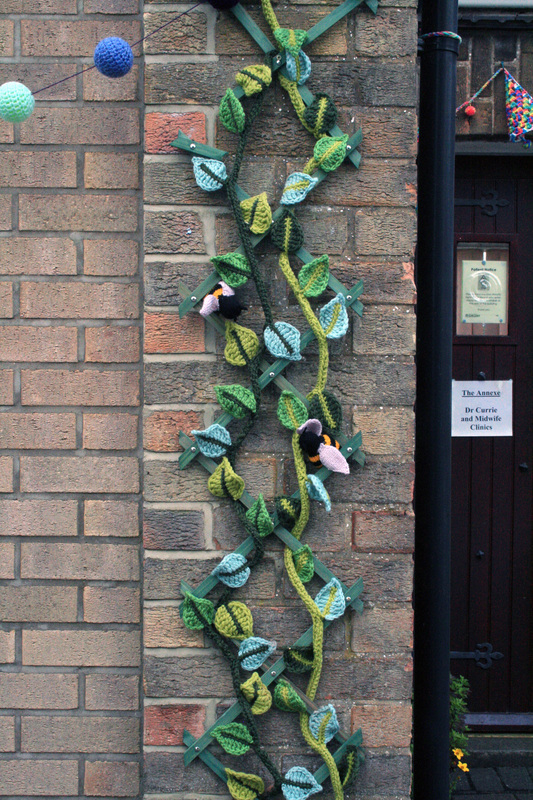 How exciting, the trellis is a lovely idea and works really well, I made the leafy vines for the 2015 yarn bombing and have never got round to finishing the tutorial, I could do it for you if it would be of interest. https://thegrangerange.files.wordpress.com/2014/09/crochet-leaf-vines-on-trellis-with-bees.jpg I wish you all the best with your project and eagerly anticipate the photos. Could I send something to be included? My pleasure, it’s always good to meet new blogging folk. Thank you for liking my post “Beanie Done, Started Wrist Warmers” at OUR RETIRED LIFE. You have a nice blog. I liked your Yarn Bomb posts. Thank you for visiting and your kind words, blogging is so much fun. A great place to share our crafting projects and find inspiration. Hi – If you read my post from 2nd March 2015 there is some news for you……. Thank you, you have just made my day, I haven’t been onto the blog for a few days so it was a lovely surprise to find your comment telling me I have won one of your lovely dishcloths. I will email my address to you, thank you again. Did you receive my email ok? Sorry – no email yet. I checked in my spam folder too. Can you reply to this message with a name and postal address? I liked your yarn bombing projects a lot. Such creativity! Thank you so much, we all had so much fun doing it to. Just wanted to let you know that I nominated you for the “One Lovely Blog Award.” Now I see you already have it. lol. You’ve been doing an awesome job! I truly enjoy your thoughtful and fun posts! Thank you so much for the nomination and such lovely words of encouragement. Thank you so much, I am honoured. Would you forgive me for not responding for a couple of weeks, I just need to get my life back after the yarn bombing is all done. I am so pleased all is going so well but it has rather taken over my life at the moment. Oh no, I am so sorry, I did not make the link properly at first but have fixed it now. email address is thegrangerange@hotmail.com . Looking forward to hearing from you, I will be doing another post this weekend with more information and some pattern links so I hope that will help. In the meantime thank you so much for your kind offer to help us make this yarn bombing idea a reality for our patients. Hello! Thank you for stopping by my blog and finding something you liked! I adore your creations and look forward to keeping up with your posts, all of which seem to be full of lots of color and smiles. Thanks again! It was a pleasure to take a peek through your work and I am flattered that you have enjoyed visiting me too. Now we can stay in touch. Thank you for visiting us. My “kid” and my “granddaughter” are my inspiration. I love you your site. It is so nice that you have a shared love of craft, hopefully your granddaughter will too, when she is old enough. btw, where are your location? Hi and thank you for visiting, I am based in a small town on the east coast of the UK, population about 65,000. Loved your little android, so colourful. Hi!!. I wanted to tell you that your crochet’s projects are beautiful, full of joy. I love everything! Thank you so much for your lovely comments. You are so right about the joy in projects I feel that a little bit of me leaves with each one. I am so embarrassed to be replying so late. I am so honoured to have been a winner but have been absent from blogging due to work commitments for the majority of this month. Huge thanks to prettylittlethingsinanbox for sharing such lovely projects. So happy you like him, I look forward to welcoming you back again soon, in the ,meantime I will pop over and see you. Thank you so much, I look forward to welcoming you again soon. The feeling is mutual, may this be the start of a long blogging friendship, Jack is so gorgeous. Hello GrangeRange, thanks for visiting my blog! Today I have some extra time to explore yours and from the little I’ve seen, I will be paying more visits. Your work is lovely and quite an inspiration source. I feel in love with all your baby blankets as well as the bear booties and I’m sure the more I see, the more I ‘ll like! So, keep up your astonishing work! Hey there, thank you for browsing my pages. So pleased you like what you see and I look forward to you visiting again soon. I love all your activities with your family, I bet your house is a bundle of fun. Hey there, thanks for stopping by, hope to see more of you too. Than you so much for my nominations, I will take time this weekend to ferret out my favourite blogs to share. Thank you for following my blog. 🙂 We have things in common don’t we. 😀 Pretty blog! I love your crochet bags, I hope we might have one of those in common one day soon. Likewise, it’s always great to connect with new people. I found your blog because you found mine first. Thanks for your comment on my new blog– I consciously decided it wasn’t going to be about crafting (maybe I’ll start another blog on that subject someday) but the Irish crochet thing just had to get in there!! Your crochet work is both fun and beautiful! I loved reading your blog. Your philosophy on life during the holidays about learning new things is really inspiring. Will come back and see you soon. Hello, hope things are well on your side..
I’ve nominated you for some blogging awards (seven, no less!). Thanks for your lovely blog! Thank you so much for the nomination, I am extremely honoured and have great pleasure in passing on the nomination to 7 more bloggers. Thank you so much, I love having you over to browse and it’s great to share in your ideas too. see you again soon. I really like the ‘Like this:’ widget, and want to add it to add it to my blog, could you tell me what its called, as when I try searching for widgets I just end up with lists of facebook like ones! The like option is on the same page as when you write a post, it is just beneath the writing box, you just need to click on the box to turn it on. The heading is Likes and Shares. Let me know if you manage to do it. Thank you, I managed to get it working. Great well done. I am pleased with myself too, that I actually managed to help. I usually have to resort to getting my children to help me! That is so nice to hear, I love the world of blogging where we all share our ideas and skills. I have also found much inspiration from other bloggers, including your good self. Unfortunately I am not so great with needle and thread! I’m with you – I love the world of blogging too. It’s amazing how many ideas are out there. I’m currently one year into not buying new clothes and trying to refashion or make them for myself. I’ve been pondering over the feasibility of crocheting lace. Seems rather time consuming! I wish i could devote all my time to crafting. I have been given a velvet jacket and after looking through your blog I am inspired to have a go at jazzing it up. I was thinking about adding other various colourful fabrics to the pockets and lapels and maybe crocheting some flowers to go up the sleeves. What do you think? Could it work, have you got any tips? Wow, that is fab. I think it may be a bit ambitious for me though, sewing is not my forte, my Mum and Sister are much better so maybe I could enlist their help. Thank you so much for the link to tips. Will let you know how it goes but don’t hold your breathe, I think it may take me a while. Thank you for following my blog! I will have fun poking through yours, too! You are most welcome, I hope you enjoy. Look forward to sharing more in the future. Thank you, you do some pretty awesome stuff yourself, your earrings are so pretty. Thank you so much for the nomination, I agree that it is a great way to promote blogs to each other that we may not have come across. I love the whole blogging community thing, the sharing of crafts, patterns and ideas with like minded folk. Congratulations on receiving your award too! Thank you for the return visit, I loved your little dolly dress. It’s great to hear, I enjoyed visiting you too. See you again soon I hope.